JBJ leans on a leathal weapon during batting practice. You can say what you want about our beloved rookie outfielder who helped us to forget who left that position last year. They say he can play defense as well or better than his predecessor. There is criticism that he has not been hitting enough, but this is coming around lately with a slash line of .234/.310/.322. What you can't say about him is that he does not have an arm to back up those amazing catches. He is second only to Yoenis Cespedes (12) in outfield assists with 11 this season. It takes a cannon to do that from center field where as Cespedes only does it from left field. 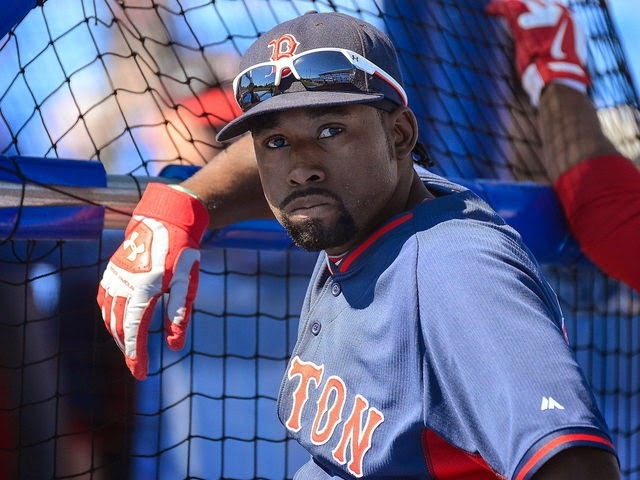 Take a look at this video of Jackie Bradley Jr. showing off his cannon of an arm at Fenway this week. Did you hear the cries and shouts from his teammates as he almost drills the guy standing in the center field bleachers? That was an estimated 390-foot throw. It is a friendly warning to all opposing base runners, think about that next time you head towards second on a long fly ball to center field.